At Modern Stone Care, our years of experience, providing maintenance services to natural stone, have afforded us the intimate knowledge required to understand the particular vulnerabilities, sensitivities, and needs of these materials. In this time we have realized how few products on the market, efficiently cater to the specific needs of these stones. This is where the idea was born to make our own line of natural stone cleaning products. Modern Stone Care currently offers two different types of natural stone cleaner, “Stone & Tile Floor Cleaner” and “Pure Stone: Streakless Countertop & Shower Cleaner.” Professional deep cleaning is required in order to properly protect and preserve natural stone. However, equally important is at home maintenance to keep your stone gorgeous for years to come. Modern Stone Care Stone & Tile Floor Cleaner is a neutral marble safe floor cleaning detergent, which is supposed to be used for regular at home maintenance on any hard surface that will not harmed by water. This cleaner was originally designed to protect calcite based stones, such as marble, limestone, & travertine. These stones are alkaline in nature due to their mineral content, from chemical etching. This cleaner’s no rinse, streak free properties make it ideal for any hard surface, as it does not leave a dulling film or residue. Special organic slats in its formula act as “moisturizers” thus preventing natural stone from “drying out.” It also contains optical brighteners to enhance the finish of the surface on which it is used. 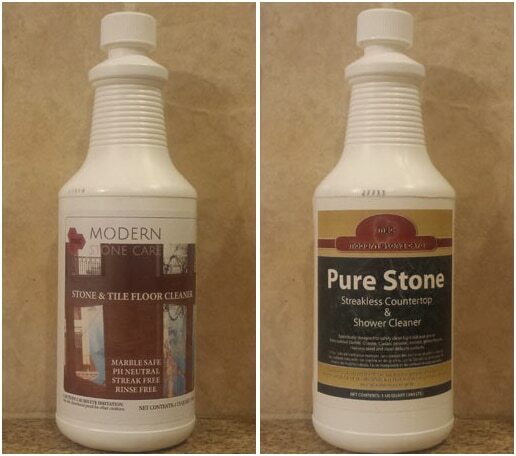 Pure Stone: Streakless Countertop & Shower Cleaner by Modern Stone Care is a slightly alkaline cleaner designed for marble, limestone, granite, corian, silestone and other manmade and natural hard surfaces. Specifically designed to safely clean light soil and grease from their surfaces. It is marble safe (will not chemically etch) and dries streak free. It’s no rinse formula makes it ideal for countertops and vanities. Its optical brighteners enhance the finish on natural stone.